EE has announced that a small number of its customers are going to receive a share of £1 million to refund wrongly charged VAT. The refund affects EE customers who used mobile data outside of the EU between October 2012 and November 2014. The issue, discovered after a customer complained, was that those customers were mistakenly charged VAT on the data bundle, which EE claims was due to a configuration error in its billing system. 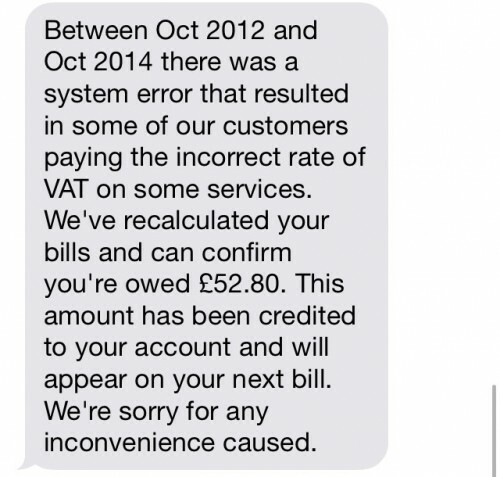 The error apparently sent the money straight to HMRC which has since returned the money to EE. In turn, EE will be returning that money to its customers. According to the network refunds will range from £2-£80 per customer, and customers will be notified of how much their refund is by text message. The refund itself will credited to customers’ EE accounts, rather than delivered as cash, which means future bills will be discounted and affected customers won’t have to do anything to get what they’re owed.